Building upon the theoretical and practical foundation outlined in their previous book, Educating English Learners, the ELAN Authors show classroom teachers how to develop a repertoire of instructional techniques that address K–12 English learners (ELs) at different English proficiency and grade levels, and across subject areas. Show, Tell, Build is organized around two decision maps for planning and implementing differentiated instruction for ELs: the Academic Subjects Protocol (for teachers of academic subjects) and the Language Arts Protocol (for teachers of language arts). 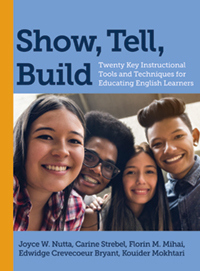 The instructional tools and techniques described in each chapter help teachers provide communication support for ELs through showing and telling, and develop their language proficiency through building their skills. The book also discusses the demands that academic language poses for English learners and ways to assess students’ proficiency in English. Part I includes ten Show and Tell Tools and Techniques. Show and Tell refer to the two types of communication support, nonverbal and verbal, that are key to the Academic Subjects Protocol. Part I begins with an overview of the Academic Subjects Protocol, concisely discussing the major factors involved in teaching academic subjects to English learners. Following this overview of the ASP are descriptions of and instructions for using the four Show and six Tell tools and techniques. The Academic Subjects Protocol (ASP) is one of two protocols aimed at differentiating grade-level instruction for English learners we presented in Educating English Learners. It focuses on academic content areas other than language arts or literacy for the language needs of English learners. The ASP consists of a series of tasks and instructional decisions specific to English learners that teachers and curriculum experts make while designing challenging grade-level lessons. We break these decisions into two phases and a total of five steps that result in the delivery of the right types of support(s) that meet the needs of English learners in lessons originally designed for their non-EL peers. A) search for visuals on Google Images: Go to Google.com, enter a topic (e.g., “solar system”), click on “Images” then “Tools” then “Usage rights” and select “Labeled for reuse” in the drop-down menu. These images may be used without requesting permission for classroom materials that you develop. B) use your phone to photograph classroom items and activities or have students use a digital camera to photograph them and add the photos to text that needs visual support (e.g., photos showing students acting out specific classroom procedures). C) save old textbooks, magazines, and other printed materials with photos and drawings and cut out their visuals. Ask friends to collect these items for your classroom. Put them on index cards and label them, or ask students to do it. 1. Lankow, Jason, Josh Ritchie, and Ross Crooks. Infographics: The Power of Visual Storytelling. Hoboken, NJ: John Wiley & Sons, 2012. 3. Eaton, Thomas. Infographic Guide to Life, the Universe and Everything. London: Cassell, 2014. 4. Higgins, Nadia. The Solar System Through Infographics. Minneapolis: Lerner Publications, 2018. 5. Gray, Theodore. The Elements. Touch Press Inc.
6. Gray, Theodore. The Elements in Action. Touch Press Inc.
1. Gray, Theodore. The Elements. Touch Press Media. 2. Gray, Theodore. Elements in Action. Touch Press Media. 6. Dredge, Stuart., “10 of the Best Virtual Reality Apps for your Smartphone.” The Guardian, June 13, 2016. 2. Fisher, Douglas, Nancy Frey, and Carol Rothenberg. Content-Area Conversations: How to Plan Discussion-Based Lessons for Diverse Language Learners. Alexandria: ASCD, 2008. 3. Mohr, Kathleen, and Eric Mohr. “Extending English-Language Learners’ Classroom Interactions Using the Response Protocol.” Reading Teacher 60, no. 5 (2007): 440–50. Reprinted on the Colorín Colorado website. 1. Languages International. ESOL Teaching Skills TaskBook. Teacher Language. 1. Cotton, Kathleen. Classroom Questioning. School Improvement Research Series. Portland: Northwest Regional Educational Laboratory, 1988. 1. Languages International. ESOL Teaching Skills TaskBook. Questioning Techniques. 3. Kagan, Spencer, and Julie High. “Kagan Structures for English Language Learners,” ESL Magazine (July/August 2002): 10–12. Part II includes ten Build Tools and Techniques. Build refers to English language development, targeted to English learners’ oral proficiency and literacy levels, which is the basis of the Language Arts Protocol. As with part I, part II starts by laying out the elements of the Language Arts Protocol, highlighting key elements in teaching language arts and literacy to English learners. The ten Build tools and techniques descriptions and instructions are categorized by which of the four language domains is the primary focus for English language development: listening, speaking, reading, or writing. Like the Academic Subjects Protocol, the Language Arts Protocol (LAP) involves a series of planning decisions that generalist teachers follow to meet their English learners’ needs. Also like the ASP, the underlying premise of the Language Arts Protocol is that lesson adjustments are made based on a gap; a gap between the language demands of grade-level instruction and English learners’ current level of proficiency. The difference between the ASP and the LAP, then, lies in that the adjustments in language arts or literacy instruction require closer attention to language, calling for targeted instruction in all four language skills (i.e., listening, speaking, reading, and writing). 1.English Language Education Section Curriculum Development Institute. Learning English Through Poems and Songs. Hong Kong: Hong Kong Special Administrative Region, 2010. 2. Languages International ETS TaskBook. 1. Ebbers, Susan M. “Linking the Language: A Cross-Disciplinary Vocabulary Approach.” Reading Rockets. 2008. www.readingrockets.org. 2. McEwan, Elaine K. “Root Words, Roots and Affixes.” Reading Rockets. www.readingrockets.org. 3. Reading Rockets. “Semantic Gradients.” www.readingrockets.org. 4. Reading Rockets. “Semantic Features Analysis.” www.readingrockets.org. 5. Beck, Isabel, Margaret McKeown, and Linda Kucan. “Choosing Words to Teach.” Reading Rockets. www.readingrockets.org. 6. Florida Center for Reading Research. Florida State University. www.fcrr.org. 7. Cognate Linguistics. “ELT Though Cognates.” cognates.org. 1. Robertson, K. “Increasing ELL Student Reading Comprehension with Non-fiction Text.” Reading Rockets. www.readingrockets.org. 2. My English Pages. “Noun Phrases.” www.myenglishpages.com. 3. No​rdquist, Richard. “Postmodifier (Grammar).” ThoughtCo. 2017. www.thoughtco.com. 4. Nordquist, Richard. “How to Recognize and Use Clauses in English Grammar.” ThoughtCo. 2017. www.thoughtco.com. 5. Grammar Revolution. “What Are Helping Verbs and Verb Phrases.” www.english-grammar-revolution.com. 6. Brook, Erin. “Sentence Clarity: Nominalizations and Subject Position.” Purdue OWL. 2015. owl.english.purdue.edu. 1. Akhondi, Masoumeh, Faramarz Aziz Malayeri, and Arshad Abd Samad. “How to Teach Expository Text Structure to Facilitate Reading Comprehension.” Reading Teacher 64, no. 5 (February 2011): 368–72. 2. Dymock, Susan. “Teaching Expository Text Structure Awareness.” Reading Teacher 59, no. 2 (October 2005): 177–81. 3. Peregoy, Suzanne F., and Owen F. Boyle. “English Learners Reading English: What We Know, What We Need to Know.” Theory into Practice 39 4 (Fall 2000): 237–47. 4. Read, Sylvia, D. Ray Reutzel, and Parker C. Fawson. “Do You Want to Know What I Learned? Using Informational Trade Books as Models to Teach Text Structure.” Early Childhood Education 36, no. 3 (December 2008): 213–19. 5. Williams, Joanna P. “Instruction in Reading Comprehension for Primary-Grade Students: A Focus on Text Structure.” Journal of Special Education 39, no. 1 (2005): 6–18. 6. Williams, Joanna P., et al. “Close Analysis of Texts with Structure (CATS): An Intervention to Teach Reading Comprehension to At-Risk Second Graders.” Journal of Educational Psychology 108, no. 8 (March 2016): 1061–77. 1. Robertson, Kristina. “Improving Writing Skills: ELLs and the Joy of Writing.” Colorín Colorado. www.colorincolorado.org. 2. Santa Barbara City College Writing Center. “Common Error Types for English Language Learners.” www.sbcc.edu/clrc/writing_center/. 3. Zainer, Leanne. “Prioritizing Common Sentence-Level Errors.” University of Minnesota Writing Center. writing.umn.edu. 4. Shoebottom, Paul. “Understanding Written Mistakes.” Frankfurt International School. esl.fis.edu. 1. “General Graphic Organizers Worksheets.” www.teach-nology.com. 2. Inspiration Software, Inc. “Visual Learning Overview.” www.inspiration.com. 3. Houghton Mifflin Harcourt. “Graphic Organizers.” www.eduplace.com/graphicorganizer. 4. Haynes, Judie. “Graphic Organizers for Content Instruction.” EverythingESL. www.everythingesl.net. 5. McKnight, Katherine S. The Teacher’s Big Book of Graphic Organizers: 100 Reproducible Organizers That Help Kids with Reading, Writing, and the Content Areas. San Francisco: Jossey-Bass, 2010. 6. Jacobson, Jennifer, and Dottie Raymer. The Big Book of Reproducible Graphic Organizers: 50 Great Templates to Help Kids Get More Out of Reading, Writing, Social Studies and More. Jefferson City, MO: Scholastic, 1999. The conclusion revisits how the 20 tools and techniques work in the context of a lesson and offers a recap of the tools’ and techniques’ place in our two protocols, offering suggestions for expanding your use of the tools.